Likely few know or remember it now, but back in the late 60s or early 70s, Random Island nearly had 2 more roads. Some may still remember near the Apsey Brook cemetery they had even cut a “line” going through the woods, passing near Island Pond (not whats labeled Island Pond on the map, that’s Fox pond), curving round it, and passing between the two ponds of Double Pond to meet up with the road to Bluff Head Cove Pond. I really don’t know the real reason for this planned road, rumors had it it was mainly as a convenience for the ministers, but not sure how much influence who had on whom to get it started. It would have been nice for all of course, to be able to more conveniently connect to Petley, Britannia, etc, but unfortunately, it never came to pass. I’ve added this map with the route highlighted, you can still make it out on the map. Link to unhighlighted version below. If memory serves correctly, there was another “line” cut from Lower Lance Cove to Deer Harbour before resettlement quashed that. I seem to recall it even being started and being able to see the road going up over the hills, though my memory may be manufacturing that. Others can correct or confirm! 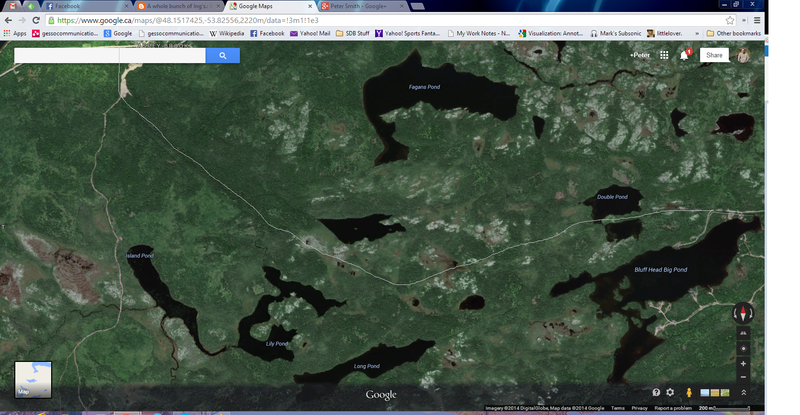 But if you use the link here, https://www.google.ca/maps/@48.1375084,-53.6848017,2386m/data=!3m1!1e3 and scroll around, you can see google even highlights the “road” that wasn’t to Deer Harbour. I’ve never made it down there, nor to any of the other abandoned communities out the end of the island, something I hope to correct someday, but it’s very disappointing to me that this road in particular was never completed. So much work, gone for naught, communities that may have prospered, abandoned. More money spent on resettlement than a road would likely have cost, especially since it had already been started. If you are standing in the right place on Lance Cove beach, you can still make out where the road was started. There is a line where the trees are all the same height.